At Banff Travel and Tours we believe in small group sizes, enabling guests to interact with our guides. Our sightseeing tours utilize our modern 24 passenger buses. All tours are guided by enthusiastic interpretive guides who love to share their knowledge with you. We provide Banff hotel pick up and drop off, light refreshments, use of binoculars and spotting scopes as well as hands-on interpretive items. Please select from the list below for more information on our tours. Guided sightseeing of Banff area, history, landmarks. Guided sightseeing to Lake Louise and Moraine Lake. Daily at 8:30AM and 1:30PM. Duration 4 hrs. Full day guided sightseeing to the Columbia Icefields. Daily at 9:00AM. Duration 9 hrs. A full day guided tour to Lake Louise, Takakkaw Falls, Kicking Horse Resort, that also includes a Gondola Ride, Bear Tour and Lunch.Departs at 8:30AM. Duration 10 hrs. Witness the glory while learning the history of the Canadian Rockies with sightseeing tours offered by Banff Travel. Trained and knowledgeable guides will lead you to UNESCO World Heritage sites, across glacial plains, or along spirited rivers. 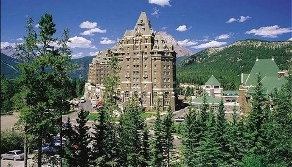 Each package is designed to highlight some of the most spectacular natural wonders in the Canadian Rockies. Take in Lake Louise and Moraine Lake, or travel to the Columbia Icefields to trek across glacial fields. Guests can also choose packages that combine the beauty of both the mountains and lakes. Each sightseeing tour highlights some of the best sights of Banff National Park on either full day or half day tours.